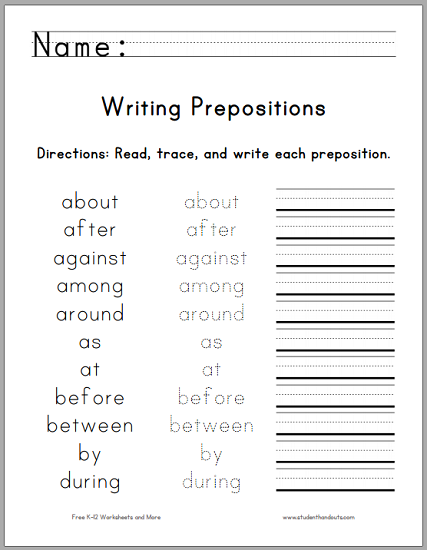 This double-sided worksheet features the top 25 most common prepositions in the English language (in alphabetical order). This worksheet familiarizes students with these common prepositions while helping kids to hone their handwriting and spelling skills. Click here to print. For more of our free worksheets similar to this, click here. Top 25 English Prepositions: about, after, against, among, around, as, at, before, between, by, during, for, from, in, into, like, of, on, out, over, through, to, under, with, without. CCSS.ELA-LITERACY.L.1.1.I: Use frequently occurring prepositions (e.g., during, beyond, toward).